You would probably see patronage growth stagnate in that scenario. There are other, much simpler and politically palatable ways to recoup costs, such as adding an extra fare band or two for trains and buses, to at least raise the pensioner concession according to CPI, spreading the cheap Sunday fare over the entire weekend at a higher cap, etc. Getting rid of guards would save a shitload. They could actually implement half of what IPART recommends instead of ignoring the bulk of what they propose. I have noticed some M set guards are now located at the back of the train not the middle. It's the thin wend of the edge. Last edited by prp002; April 15th, 2019 at 11:28 AM. Must have been something wrong with *both* of the middle cabs? I've seen them running the train from car 4 instead of 5 before. Getting rid of guards would save a shitload. Plenty of staffing efficiencies to be made. Imagine how the savings could be reinvested into better services. I was on the Southern Highlands train a couple of months ago, and when it stopped at Picton there were three station staff hanging around the platform. Two of them seemed to be standing around talking, the other one was waving a flag at the guard of the two carriage long train, to tell him the view was clear, as if the guard could not see his two carriages. I'm not saying 2 of those 3 station staff should lose their jobs, just that those resources should be deployed somewhere else in the transport sector. 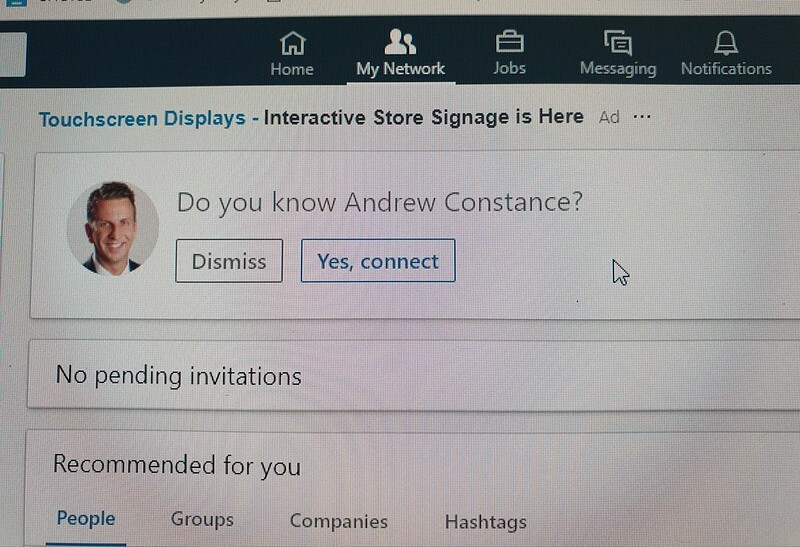 I'm sure there's a more productive role they could be filling doing something else. It would be more awkward for the passengers’ safety if they knew each other too well though. A taste of things to come at Museum, as a new round of period ads will adorn the platforms. This is the only one installed to date, on platform 1. An old style candlestick telephone as the emergency help point would have added to the ambience. Not going to lie, It really feels right at home there. Bring back the VD ads! 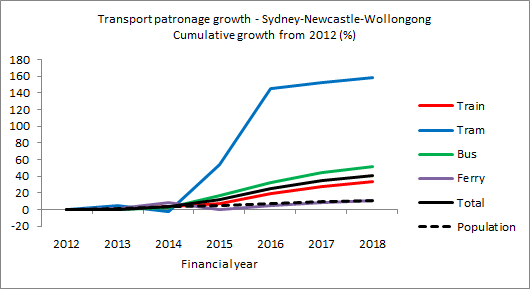 Just messing around with data, really does highlight the phenomenal public transport patronage growth in Sydney compared to the rest of the country. - Is the kink up for buses in 2014 due to the introduction of Opal? Other than B-Line in 2017, I can't think of any notable improvements in the bus network - if anything I thought the closure of George St would be more noticeable. - Curious as to what is going on with ferries in 2015, and I would have thought the opening of Barangaroo Wharf in 2017 would be more notable. Maybe it's too soon? - What's the kink in 2015 for trains? Opal was over a year old by this point. 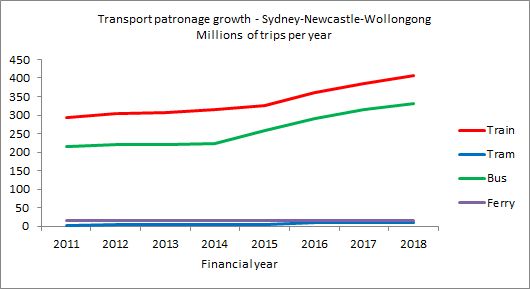 Unfortunately the data on TfNSW's website lumps in all the Opal service area into one for anything prior to 2016, so I've not been able to separate out Newcastle and Wollongong. Either way, I don't think it can be properly separated - A passenger on a NSW TrainLink within Sydney should count. It shouldn't matter if they took the Blue Mountains service from Central to Strathfield, or a Kiama service from Bondi to Redfern - that's all clearly Sydney patronage and the passenger probably didn't notice the difference. So I'm not too bothered by considering it as one larger integrated area. The top-level chart is more than just boring horizontal lines! Cumulative growth chart dominated by the opening of the inner-west light rail extension. Removed light rail for a more workable scale. 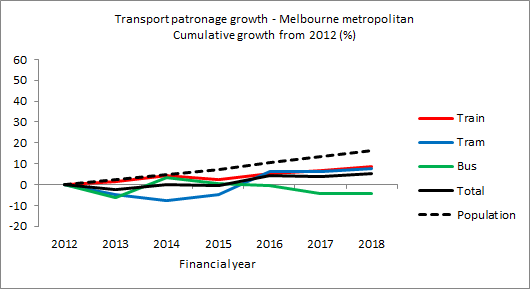 Contrast to Melbourne with the same scale Higher population growth but much, much lower patronage growth. ^ Amazing numbers for Sydney when compared to Melbourne. This will only grow further when the NW metro and CESLR opens. Alarming numbers for Melbourne considering the 3rd world population growth numbers. Something wrong with how the city is developing. Opal is the big one I think, because it simplified ticketing so radically compared to what was there before. Melbourne already had the zone system. Much of this can be linked back to Sydney’s constrained geography. ... and Sydney’s better overall planning? Have you been to suburban Melbourne lately? Most of the middle ring suburbs are untouched by medium density development compared to Sydney. So many detached single level homes, and any "medium density" that exists is rarely more than about four levels high. This is an average street in a suburban 12km from the CBD, 5 mins walk to a station on one of the highest frequency lines. Meanwhile on the outer fringe, construction of new shitsville sprawl suburbs down there has gone insane - and there's an absolute shitload of land in the pipeline that's been rezoned for more shitsville suburbs. Places like this one repeated over and over and over again. Oh yeah, and the provision of service to these new sprawlburbs is so appalling that it usually takes about 18 months after the entire estate was settled until they bother starting a new bus route that runs at a 40 minute peak frequency. So combine that with the present government's lack of interest in providing extra rail services, and the pathetically crap services still provided during some parts of the week (like hourly Sunday morning trains... ), is it really that surprising that patronage isn't rising as much as it should? Hourly train service! Even our Carlingford line have a higher frequency. I know public transport is pretty bad in the suburbs. The state of transport is like Sydney in 1960s. Yeah, on a Sunday morning the trains in Melbourne run 60 minutely before 8am. On the most lines it's then 40 minutely until 10am, except for those few lucky lines with half hourly trains. God forbid the thought that anybody gets out of bed before midday. But I will give them some credit though - it's only a recent thing (since 2016) that trains operate before 8am on a Sunday. It's pretty sad when you consider that in Sydney they run trains every 15 minutes from 4am to 12am. Like you said - virtually none of this growth has come from new infrastructure. We’ve had the opening of SWRL and the rollout of B-Line and that’s pretty much it. 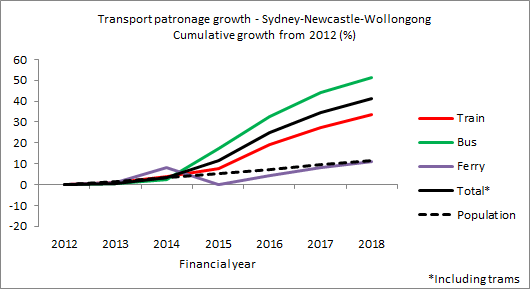 I am very interested to see how significant the rollout of Metros Northwest, City and Southwest, West and Western Sydney Airport is for public transport patronage and JTW Census data in years to come. Sydney has long led the nation in PT patronage (and let’s be honest, that’s despite our generally subpar systems that struggle to respond to isolated events). Metro will help change the entire narrative around public transport in Sydney.